Your automobile requires regular maintenance for its longer life and smooth running on the road, and a specific amount of money is required to manage these expenses. You should get ready for sudden expenses, such as an accident that bring some damage to your vehicle. 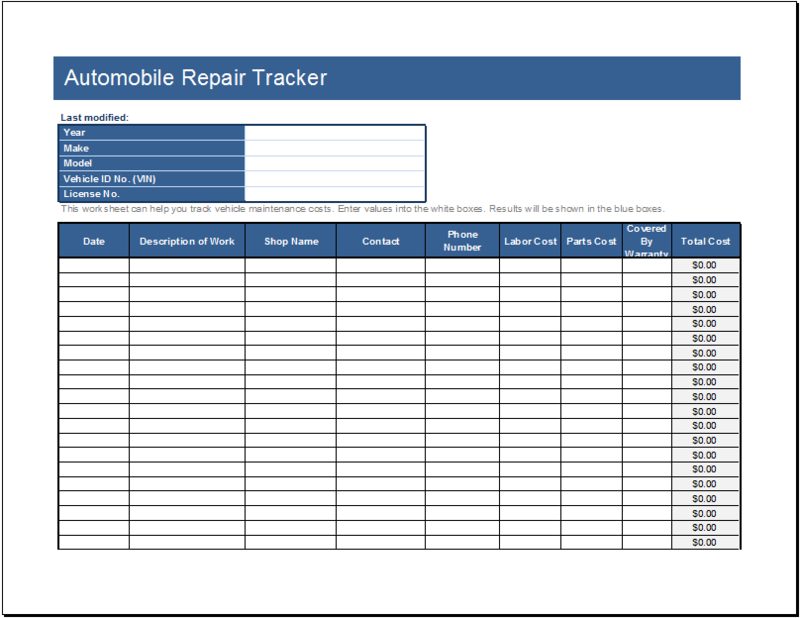 All these expenses are important to manage while having a vehicle and the automotive repair tracking template will help you to track your vehicle maintenance and repair expenses. The sample template is suitable for your personal use car or for a business vehicle. You can record the regular maintenance schedule of your vehicle to keep it in good form. It is designed with all important contents, and you can track all expenses related to the maintenance and repair of the vehicle in it. In this way, you will get an idea about the total expenses, and you can easily allocate a specific amount of money for the vehicle maintenance on every month. The tracker is equally good for the workshop, because the owner of the workshop may not be able to remember about the vehicles outside his workshop. You can write about the vehicle, the name of its owner and due date to return the vehicle after maintenance on the tracking sheet. The record will help you to explain the problem of each vehicle to its owner.